Affronted by The Falling Rocket, John Ruskin accused Whistler of “flinging a pot of paint in the public’s face” in the Fors Clavigera. As a leading art critic of the Victorian era, Ruskin’s harsh critique of The Falling Rocket caused an uproar among owners of otherWhistler works. Rapidly, it became shameful to have a Whistler piece, pushing the artist into greater financial difficulties. With his pride, finances, and the significance of his Nocturne at stake, Whistler sued Ruskin for libel in defence. In court, he asked the jury to not view it as a traditional painting, but instead as an artistic arrangement. In his explanation, he insisted that the painting was a representation of the fireworks from the Cremorne Gardens. 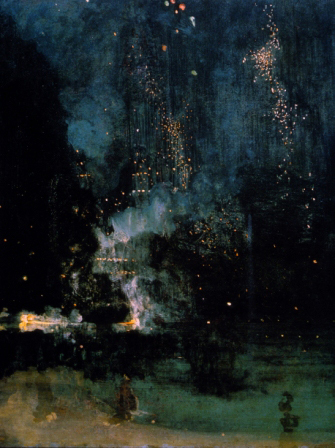 Sir John Holker: What is the subject of Nocturne in Black and Gold: The Falling Rocket? Whistler: It is a night piece and represents the fireworks at Cremorne Gardens. Sir John Holker: Not a view of Cremorne? disappointment on the part of the beholders. It is an artistic arrangement. Sir John Holker: You send them to the Gallery to invite the admiration of the public? Whistler: That would be such a vast absurdity on my part that I do not believe I could. soon did you knock it off? Whistler: I beg your pardon? Sir John Holker: The labour of two days, then, is that for which you ask two hundred guineas? This entry was posted in Fine Art Adventures on September 18, 2014 by bobjohnsongallery. 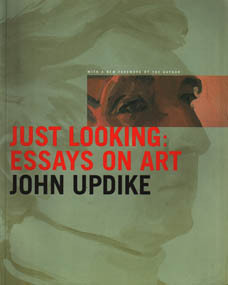 Enjoy this beautiful essay, by John Updike, on American Realism as imagined by Winslow Homer and John Singer Sargent — excerpted from one of Updike’s three books that are a collection of his essays on art. I enjoy this romantic view of the subject matter as well as the discerning eye and the wondrous mind and language of a novelist. This essay is titled AMERICAN CHILDREN. – Bob J. “AMERICAN CHILDREN – The boys and girls depicted here might not mix very well if they were released from their frames, but separately they compose two peaceful groups and two beautiful paintings. 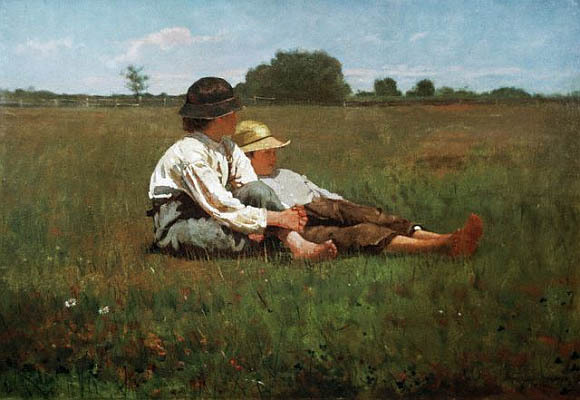 Winslow Homer’s anonymous lads are taking their ease in a pasture; the daughters of the prosperous Edward Boit are scattered through two fine rooms, and all but one of them gaze with respectful curiosity at the busy bearded intruder into their home, the fashionable painter John Singer Sargent. The dashing impressionism of Sargent’s technique carries a generation farther Homer’s flickering grasses and dabs of sunny red, and the triangular pose of the little girl in the foreground mirrors the unified shape of the two country idlers. Both painters surround their childish subjects with large margins of environment. The effect of silence: silent vases, silent sky, silent carpet and turf underfoot. A great hushed world waits around these children to be tasted, explored, grown into. a little taller and older still, is half-turned into it. The huge vase she leans against suggests a woman’s shape. These young ladies are watching, not just the painter, but us, to see what we will do next, and whether what we do will be worthy of their responding. Like butterflies, they will elude us if we startle them. 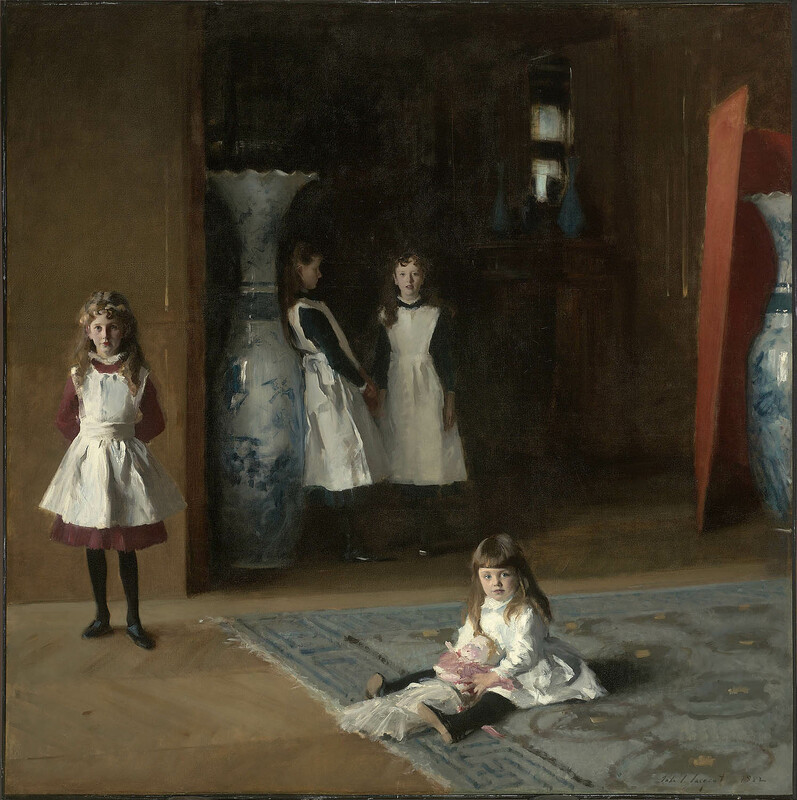 Sargent’s painting could have been a mere commission, an expert piece of toadying within the upper classes, but the jaunty eccentricity of its composition, and a daring within its deference, save it for art. Winslow Homer’s could have been a bit of calendar art, falsely bucolic, but for the abstract power of a severe and stately composition that locks the barefoot pair as if forever into the center of the canvas and that lends solemn substance to a fleeting summer day. There is a mystery to the faces; the painter has declined all opportunity for easy anecdote within the ruddy shade of those hats. Both artists have attempted honest portraits of children, as perhaps only Americans could have done. Though the Declaration of Independence nowhere promises a better deal for children, the American child does appear freer than his European counterpart and is taken more seriously — as a source of opinion, as a market for sales, and as not just a future inheritor but an independent entity now, while still a child. Childhood and then youth are seen in our democracy as classes that cut across class distinctions. Within their frames these two sets of children are similarly pensive. Responsible but powerless, childhood does not smile; it watches and waits, amid shadows and sun.” – J. U. This entry was posted in Fine Art Essays on July 4, 2014 by bobjohnsongallery. 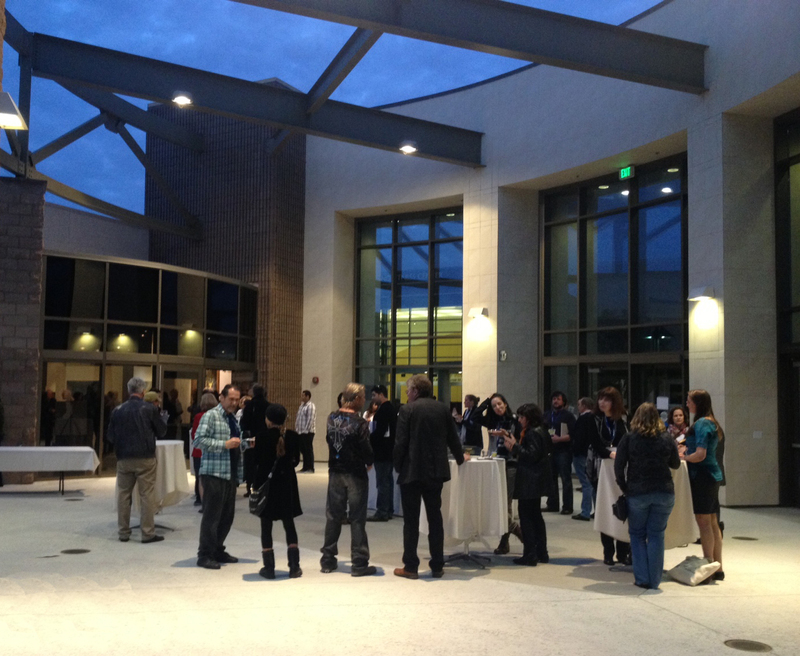 The Representational Art Conference 2014 was held in Ventura from March 2 to March 5 and presented by the California Lutheran University Arts Initiative. TRAC2014. 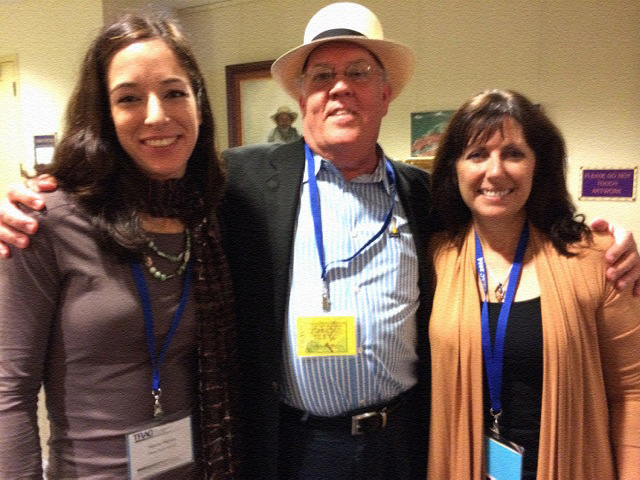 It all started when Linda Schroeter informed me that TRAC was an event not-to-be-missed. A forum for people who embrace Contemporary Realism and all forms of Representational Art. 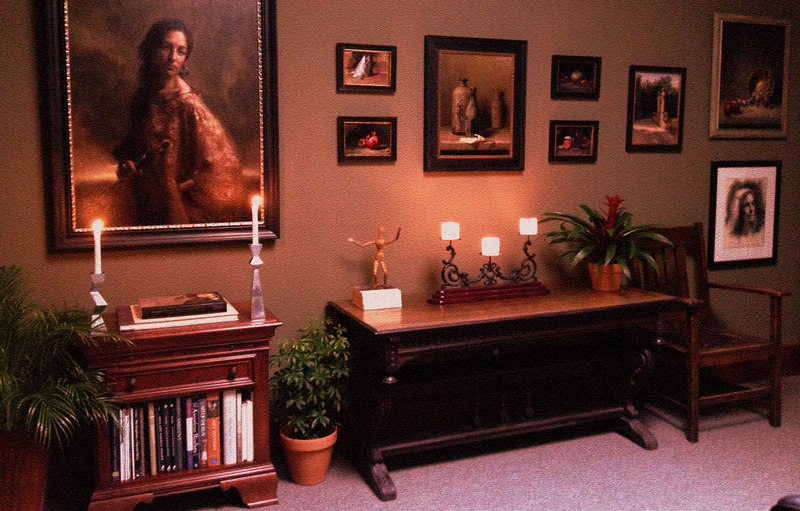 I was in the process of completely re-designing all of the spaces in my gallery: warming up the rooms for a proper atmosphere to feature the representational art of Schroeter, as well as Sebastopol artist, Naomi Marino, who had just returned from five years training at the Angel Academy of Art in Florence. My gallery spaces are now radiant with their brilliant paintings. As the three of us were preparing for our first exhibition at BJGALLERY it was soon determined that the three of us would attend TRAC2014. Together.. . . . And we did. And I just got home. In my need to write about TRAC and all that I saw and felt and learned, I’m using this seminal event to launch the “From Roll Top Desk of Robert A.” column. March 5, 2014, Ventura — I arrived at the Crowne Plaza Hotel Sunday night and registered around 7:00. There was a robust crowd enthusiastically moving from conference rooms to ballrooms to halls where art demos were in full swing, vendors with generous offerings of art supplies were at every corner and representatives from ataliers and academies were hawking their programs. I spotted Naomi at a ‘Mixed Media’ demo and Linda at a ‘Portrait in Oil’ demo. The Joint was Jumpin’. So, with my Conference ID Badge and my Canvas Goody-Bag I made the rounds and elbowed my way in. Sunday, March 2nd was Oscar Night in the rest of the world. But not here in a crowd of 250 artists. I recall seeing, out of the corner of my eye, a big screen in the lounge, with some red-carpet-ish thing going on. But I, along with everyone else, was too engrossed in the wealth of Art that boldly flanked that black slab of electric noise. It was that kind of visual and philosophical contrast that became an ongoing theme for the days to follow. Days that took on a university feel — as all of us were showered with academic and scholarly insights, opinions and perspectives. That Sunday night glimpse was an indicator of the energy, enthusiasm and valuable lessons that were in store. I went to my room to rest up and prepare for the following day, with breakfast at 8:00 and the keynote speaker at 9:00 — Oxford Professor, Roger Scruton, fresh off the success of his incisve book “Beauty” would prove an inspiring speaker. The last time I felt this excited in So. California it had something to do with Mickey Mouse & Mister Toad’s Wild Ride. This was definitely a FINE ART ‘E-Ticket’. Upon registering, each of us was given a schedule of “papers” that were being presented over the next three days. After the kick-off breakfast we were on our own to devise our personal program by selecting the speakers and topics of our choice. 9AM. Roger Scruton set the proper tone for the event. Intellectual. Opinionated. Informative. His talk was laced with fine-tuned observations of the state of representational art and peppered with historical and philosophical quotes. From Jacques Lacan to Hegel to Mahler to Clement Greenberg, we were enlightened to the good news that is in store for those who embrace the values and traditional qualities of representational art. And we were graced with Roger’s views of the dominant post-modern world of “fake” art (from fake emotions) and “the reality that feeds on fakes”. And that Andrew Wyeth is finally getting his due. . . as an ARTIST. I enjoyed Scruton’s theories and views and joined in the standing ovation that followed. Whereas I am not as stridently opposed to the dominant post-modern state-of-the-arts, I definitely welcome this “Movement” to ignite the emergence of contemporary realism into our culture and into the hearts and minds of the next generation. I felt a unifying sense of purpose and interest from everyone I met over the next few days. A shared passion for the kind of art that is being created by trained academic (and intelligent) artists. All whom I met and conversed with were focused on the importance and depth of this conference. I proceeded to attend my personalized schedule of speakers. Eager to listen and to learn. As I sat in packed rooms to hear the views of individual speakers I was caught up in the swell of what was referred to as the “Movement’. This surge of interest in our shared passion for representational art that brought us together. (Souls from 29 states from across the nation). 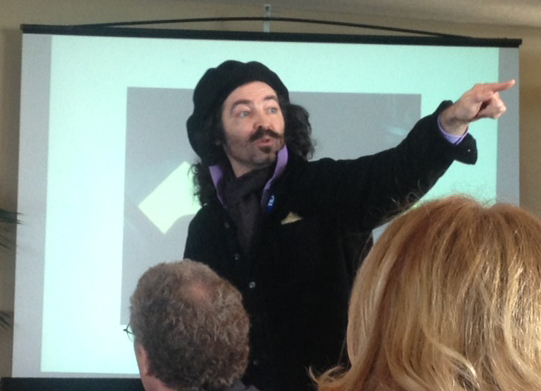 Presenters like Alan Lawson, Realist Artist, who spoke of “Thought & Emotion”. Michael Pierce, Professor of Art at CLU, who spoke of “Emergence”. Peter Trippi, Editor-in-Chief of Fine Art Connoisseur, who spoke of “Community”. Odd Nerdrum who spoke of “Kitsch”. Ruth Wiesberg who spoke of “Art”. And it was all, unwittingly, tied together into a form of solidarity that was palpable. Briskly roaming the colorful halls, revisiting the generous vendors and speaking with new friends, I was continually recharged by the energy that was everywhere. All in the company of great art and great artists. I guess you could say I had a pretty good time. Linda and Naomi and I made the best of it. We touched base to share experiences and to recommend others. I was impressed by both of them. By their eagerness to learn more about their craft. And to learn of the philosophy, history and values that are behind the kind of beautiful and exotic art they create. I left on day three but they stayed for day four. Texting me the great moments that were continuing to happen. As I drove north I couldn’t resist visiting Waterhouse Gallery in Santa Barbara, that has been exhibiting realist art for over 30 years. Entering San Francisco I took a turn at Geary St. and headed for the John Pence Gallery (Realist Gallery established in 1975). THE Realist Gallery. Those galleries — along with the amazingly educational TRAC2014 event — inspired and motivated me to continue my mission to connect art lovers with talented realist artists. To be part of The Movement. The Community. The Emergence. The Kitsch. The Thought & Emotion. The Art. This entry was posted in Fine Art Adventures on March 11, 2014 by bobjohnsongallery.